I've been thinking about this post from August 2010 lately. There are, I think, a lot of factors that cause a preaching rut, which these may or may not address. Nevertheless, I've found them helpful and felt like re-presenting them. In this post I mention being nearly finished with my second tour through the lectionary, and now I'm nearly halfway through my third. So yeah, these things (and others I haven't thought of) are worth keeping in mind. Not too long ago, Scott wrote about a preaching quandry he's been dealing with, one facet of which is whether he uses his experiences as a father too often for sermon illustrations. While I try to be very conscious about generally avoiding illustrations about my family, I can certainly relate to the basic issue: getting stuck in a preaching rut. In three more months, I will complete my second tour through the Revised Common Lectionary, the three-year cycle of suggested texts for each Sunday and holy day of the church year. I've seen these passages twice, some of them three times now. And that's not counting the ones that show up more than once over the course of one cycle. So I've been very concerned with the freshness of my preaching lately. It may have more to do with my own sense of inspiration--being inspired by the texts I have to choose from--than what the congregation notices. But I have to believe that if I'm not feeling inspired, they'll notice. 1. Go off-lectionary sometimes. Obviously, right? If none of the suggested texts are speaking to you, pick something else. The question then becomes how one goes about choosing a text. There are a couple possibilities. First, what's immediately around the suggested text? At times, the lectionary selects seemingly isolated passages, particularly in the prophets and wisdom literature. At other times, when it's suggesting passages from the same book over multiple Sundays, it inevitably skips over stuff. One example coming up in September is the lectionary's treatment of Luke 14. The lectionary includes Jesus' instructions about sitting in less honorable places at dinner parties, but then skips the parable of the man who ended up inviting the poor to his banquet. Maybe that parable speaks to you more than what the lectionary suggests around it. Second, what have you been reading lately? Is there a book you've read recently related to scripture or theology that quotes a text you've really resonated with, or have thought of in a new way? Maybe that text should get some time on Sunday morning. Finally, there are some well-known stories and passages that don't show up in the lectionary at all. Daniel and the lion's den. The three guys in the fiery furnace. Cain and Abel. Some may cringe at these examples and say, "Well, no wonder," but these were Sunday School staples, at least when I was growing up. So people may know of them from that, or from other references in the wider culture. Maybe they need a fresh reading and hearing. Caveat: some passages are more appropriate to be treated during Bible study than during worship. 2. Listen to other preachers. This is one that I don't do often enough myself, but I always find that it reaps rewards. 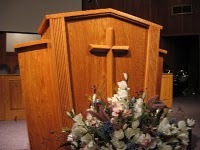 Obviously, pastors with regular Sunday preaching duties can't run off to hear other preachers at that time of day. But there's this wonderful thing called the internet that includes something called podcasting. My go-to guy in this instance is Rob Bell, whose conversational tone and accessible references always get me inspired to prepare for the next Sunday. Note that I said "listen," and not "read." Barbara Brown Taylor's books are great and all, but if nothing else they'll help you become a better writer, not preacher. Or, as Lauren Winner observed at the Festival of Homiletics, they'll make you feel horribly inadequate as a writer. Whichever. The point is: listen, not read. 3. Change up your delivery. Maybe both you and your congregation already know what'll be heard during the sermon: an opening illustration or joke, segue into an introduction of the text, wrap back around to explain how the opening ties into the text, application, amen. Stick with this same formula for too long, and both parties may get tired of it. If one always knows what to expect, it may be easier to tune out. Any basic preaching class probably presented at least a half dozen structural styles...maybe this next week is the week you break out one of the others instead. Or what might it be like to preach from a Biblical character's point of view? This isn't just a structural thing; it's also a delivery thing. If you're a manuscript preacher, try speaking from an outline. If you're an outline preacher, try going with no notes at all. Since the beginning of the year, I've been back to preaching without notes after I noticed that even preaching from an outline was getting too stilted. This sort of change-up gets preachers into a more experimental mindset and keeps both parties guessing. 4. Get yourself some culture. One of the best pieces of advice that I received in seminary from one of my professors was to take in plenty of non-theological activities: movies, books, music, etc. In part, this is to help pastors divert attention from ministry. It also helps pastors remain aware of the larger culture in which s/he and his/her church is set, and this inevitably gives us something to talk about besides abstract theological concepts. Truth be told, most of my illustrations are derived from culture at large. I used to rely on books of sermon illustrations, but after a while they seemed either canned or outright unhelpful. A family story makes it in rarely, as may some experience I've had (and never with me as the hero). I find that cultural references are the stuff that people can immediately tap into, whether I'm using them to help illustrate my point or whether I'm pushing back against them. But there's also a certain form and tact involved to keep these references from seeming desperate to be cool or outright cheesetastic like, say, this. Like I said, this isn't exhaustive. And it may be only moderately helpful. But as one who knows what a preaching rut feels like, I thought I'd pass along what I've found helpful.